These tacos area easy and delicious! I loved the seasoning on the tilapia. Definitely can't wait to try it again and toss the tilapia in another dish. Maybe over some pasta too. So good!!! Combine the dry seasonings in a small mixing bowl. Whisk to combine. Lightly sprinkle each side of the tilapia filets with the seasonings. Heat the olive oil in a large skillet over medium heat. Add the tilapia to the pan and cook the tilapia for five minutes on each side until fish flakes easily. Warm the tortillas. Spread guacamole on each tortilla and top with some black beans. Place a half or more of a tilapia filet on to each tortilla. Break the filet apart a little bit so it flakes. Serve with pico de gallo or salsa if you desire. 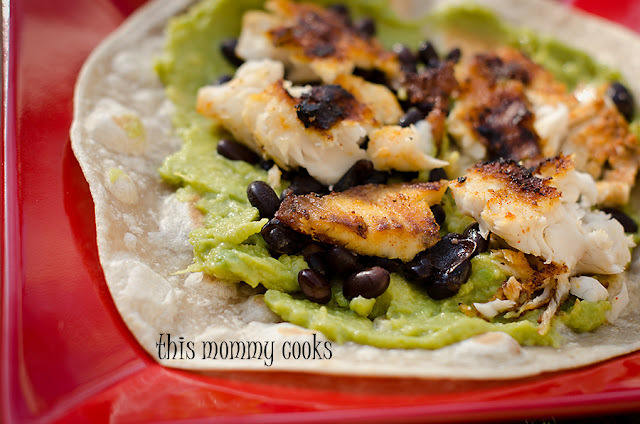 I have been looking for a new tilapia recipe, and this one looks great! Thanks for sharing. This sounds delicious! I adore fish tacos! My family, though, not so much. I guess I could eat them by myself! These look awesome and so easy too!